This is in response to your request for more information on CedarWoood Park. 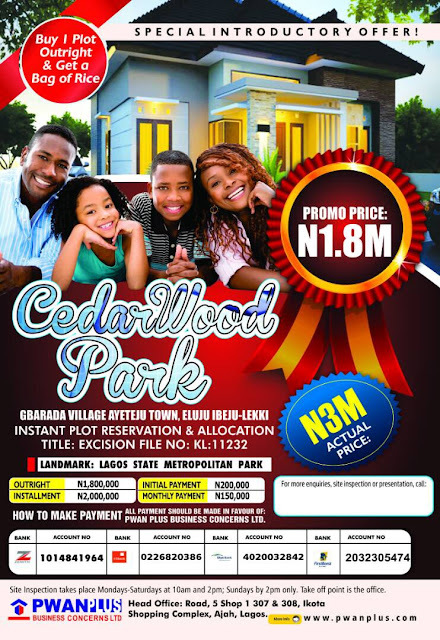 *DEAL DESCRIPTION:* ```CedarWoood Park was conceived out of the urgent need to provide a suitable, conducive and affordable site for home seekers and investors alike. The estate is a neighbour to``` *Lagos state metropolitan park . * The estate is a fast developing axis, close to LEKKI FREE TRADE ZONE, AMEN ESTATE, ELEKO BEACH, GENERAL HOSPITAL amongst others.